A major mixed-use project with thousands of co-living apartments in Miami is one step away from fully moving forward. The Miami City Commission voted on Thursday to approve Robert Wennett’s Miami Produce Center special area plan on first reading. The proposed 1.4 million-square-foot development would be built in Allapattah, a neighborhood east of Miami International Airport and west of Wynwood. 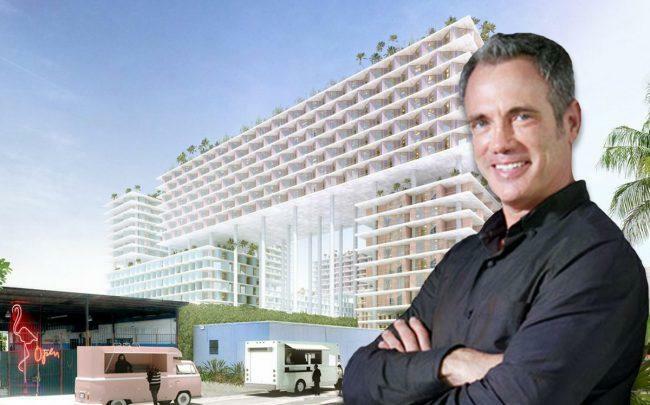 Miami Produce Center, designed by Bjarke Ingels Group, could have as many as 2,400 co-living units and 637 traditional residential units. Co-living spaces are apartments with fully functioning bathrooms that share a kitchen with other units. While relatively new to Miami, co-living apartments are popping up in Los Angeles, San Francisco and New York. The project would be one of the first in Miami with a major co-living component. If Wennett were to build only traditional residential units, the number of units would be reduced by nearly half to 1,237 units. “If it works here, we will explore [co-living apartments]. If not, it won’t be,” Miami planning director Francisco Garcia told city commissioners. As part of the project, Wennett would repurpose three existing warehouses that local fruit and vegetable wholesalers use for storage into retail spaces, and he would build four 20-story intertwined buildings and urban gardens where fruits and vegetables will be grown. The completed project would have 230,886 square feet of office space, 128,971 square feet of retail space, 22,176 square feet for “educational uses” and 1,094 parking spaces. Community support for the project appears split. Residents who spoke against Miami Produce Center claim it will accelerate gentrification in Allapattah, while supporters said the development will create jobs and attract middle-class workers to a low-income neighborhood.